Fruitless Pursuits: Half Hour History Episode 2: The True History of Lagertha that isn't True! 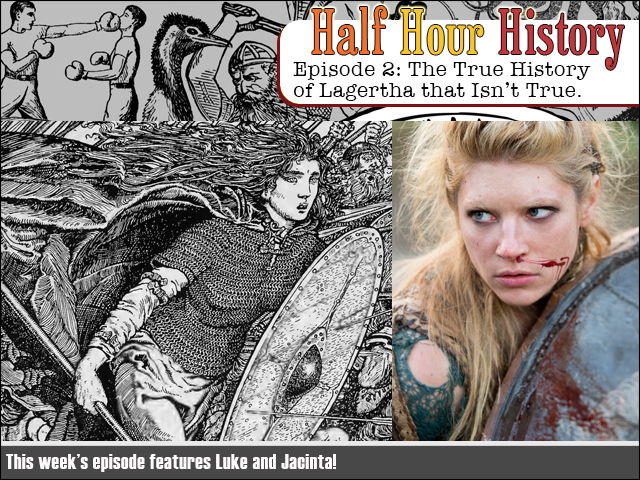 Half Hour History Episode 2: The True History of Lagertha that isn't True! Welcome to a brand new fortnightly podcast where your unqualified host Jacinta attempts to explain an interesting bit of history and an even less qualified co-host Luke attempts to derail her. Many of our topics will be pop culture inspired, and after both undergoing marathon Vikings viewings we were pretty keen to find out the true history behind our favourite kickass viking shield maiden, Lagertha! Jacinta delves deep into a whole lot of history that might not even actually be true, thereby undermining the very premise of the show in the second episode. Classy! FPcast for June 5 2017: Wonder Woman!